The political chance to exploit this death was too good to miss, and canine solidarity was met in kind by a Russian gesture from the Interior Ministry to provide a puppy in turn. Dobrynya was duly described as the dog that melted French hearts. Various dog owners, without a second thought, posted pictures on various media platforms featuring dogs on hind legs, sporting a French flag. One beagle was given to chewing on a sheet with Diesel’s name written on it, covered in tricolour love hearts. Other “dogs of war,” also made their photographic, and photogenic appearance across the media. They, it is suggested, must have known what this was all about. Such behaviour sent sparks of rage through areas of the world where the focus on such animal feats was seen as less important as human fates. Boko Haram had been heavily involved in a campaign, replete with suicide attacks, on civilian targets. As the fate of Diesel was reaching Twitter pitch, Nigeria was still recovering from attacks which left some 2000 dead were registering a relative murmur. Some critics saw this as a disturbing revelation. 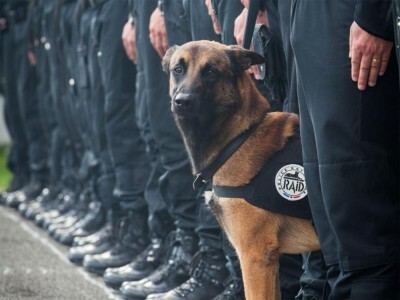 Regular RT pundit Catherine Shakdam suggested that, “Much can be said about a society when it cries over a police dog more than its own on account of geography and ethnicity.” Ben Norton, writing in a similar vein for Salon, felt that the appreciation for a French police dog’s life said more about a pressing loss of humanity than anything else. Empathy and proportionate grief are never equally distributed. Horrors are a matter of unequal parcelling out, and reflection. The human conscience is never capable of focusing on more than a few matters at a time, and such a focus is culturally and contextually limited. Your neighbour’s fate is probably more relevant than a suffering African child, though an illusion is often given that African lives matter. As suffering victims, perhaps; as full human beings, less so. In canine friendly societies, dog lives count. The domestication of the animal eventually saw it becoming unquestioning companion and servant. In literature and art, the dog would come to represent steadfast fidelity to often brutish masters. The fate of a police dog, aligned with security forces, was bound to deliver a few throbbing heart aches to a situation that had already been saturated with Parisian reflection. It may seem callous and even misdirected, but such historical acts of commemoration for animals caught in the line of fire have caused bouts of fixation. Leaving aside the seeming geographical and ethnic selectiveness in Dieselmania, a thought should be spared for countless millions of animals who have served in the folly of humanity’s wars and conflicts. They were hardly asked to be bombed, shelled, or killed in conflicts even their human counterparts can barely understand. In a sense, the other side of this saccharine episode serves to cloak the enormous, untold casualties that are suffered by other members of the animal kingdom when their biped masters get busy killing each other. A genuine concern about the reaction to Diesel’s fate should centre on the way his life has been used to serve a patriotic end. This commemorative instinct has found form before, supposedly to overcome the insensitivity shown by humans to their fellow warrior species in conflict. But this tendency provides its own dangers, sanctifying conflict even as it appropriates animals to that end. For the dog Diesel, pity the war, and pity his fate. He was not a sentient human, with all those faults, sent to war in the service of a nationalistic or patriotic creed of which he had no understanding. It might be argued, convincingly, that he was its most exalted victim. There may well be plaques – and a statue. But dogs, as former veterinarian and war veteran William W. Putney noted, do not build monuments to their dead.